Raiders fans this past season came to know Philip Wheeler as the high-motor linebacker with the long, black hair flying from under his helmet. No. 52 was one of the few working parts on a defense that was largely flawed. Wheeler, in his first season in Oakland after four seasons with Indianapolis, played all 16 games, led the team in tackles with 109, had three sacks and also forced two fumbles. He also ranked as one of the NFL’s best in quarterback pressures. He signed a one-year free-agent deal with the Raiders last March, and proved to be one of the team’s best offseason moves under new GM Reggie McKenzie. Now, McKenzie must decide whether to keep Wheeler around another season. On Monday, Wheeler seemed to express his desire to stay in Oakland by retweeting this Tweet to him by a Raiders fan: “We want you in Oakland the rest of your career!” Since the end of the season, in fact, Wheeler has often retweeted messages from Raiders fans urging him to stick around. 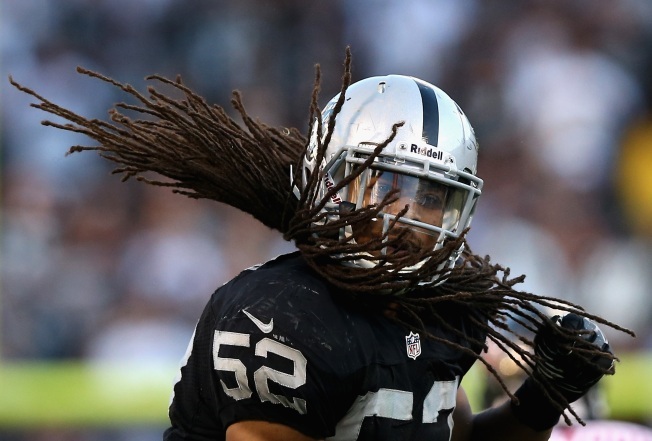 For the Raiders, the question isn’t whether Wheeler is a good fit for the defense. There’s no question he is. By the end of the season, he not only was one of the team’s best defensive players, but the guy calling defensive plays. The question for the Raiders – reported to be as much as $4.5 million over the salary cap – is whether they can juggle and cut their roster to keep Wheeler and other key unrestricted free agents, a group that includes tight end Brandon Myers, who emerged last season into one of the AFC’s best (79 catches). The Raiders could put the franchise tag on Wheeler to keep him for another season but, as Williamson noted in a separate post last week, that would be costly. The NFL’s franchise tag for a linebacker is much for expensive than for a tight end, so Oakland could more efficiently tag Myers. Last season, Wheeler signed a one-year deal for $700,000. It sounds as if he would stay in Oakland for a lot less than that $9 million franchise-tag price.